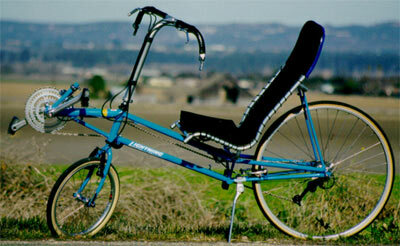 The Lightning P-38 is the classic racing recumbent bicycle. 30+ years in products, options including, streamliner, reclined seat, suitcase and heavy duty. No, not the World War 2 airplane, that was a P-38 Lightning. This is the Lightning P-38. Any questions? Clearly Lightning likes to name their bikes after airplanes. We’re waiting for them to produce the Lightning C-130, but no sign of it yet. 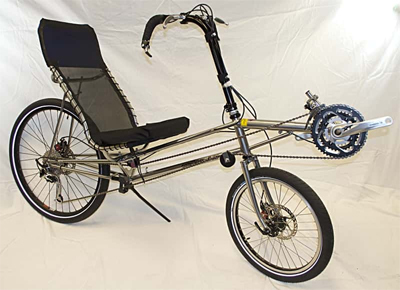 Lightning’s original design was one of the first widely produced short-wheelbase recumbents. It hasn’t changed very much since it appeared in the 1980’s because it didn’t need to. The P-38 is light and stiff for great power transfer. 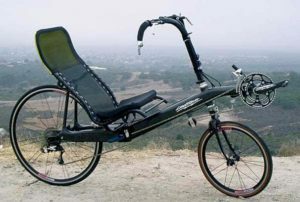 It climbs remarkably well, which is a plus here in the “Texas Hill Country.” It isn’t hyperbole to say that this is the classic recumbent road bike. All P-38s are made in the USA under the supervision of the original designer, who owns the company. They always have been. We don’t really stock the P-38, but we stock some demonstrators. P-38s are made to order based on several measurements we take on the customer. 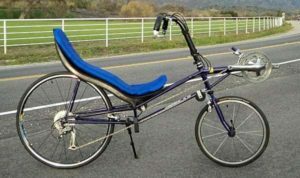 These bikes are hand-built for the intended user and there is a wide variety frame sizes, seat sizes, boom lengths, riser lengths, and color choices. It just doesn’t make sense to stock a showroom model for sale when that much is done to order. Since P-38s are built to order you can equip it however you want, but Lightning offers a few standard component packages. The basic “Sport” package has what you need to roll with all good parts and mountain bike brakes. The “Performance” package is the Sport package with road bike brakes, a lighter fork, and 130mm rear spacing (for road bike wheels). The “XT” package better mountain bike parts and disk brakes. The “Velocity” package upgrades to Lightning’s proprietary all-carbon crankset and Velocity wheels. 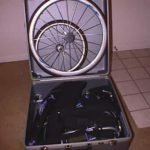 For only a few gazillion dollars extra you can get the “Voyager” frame modifications, which allow you to pack your P-38 into the Voyager suitcase. Actually it is only $1900 for this kit, including the suitcase. Three S&S couplers join the frame, and the seat splits in two. The ROX upgrade adds 40# to the weight capacity, shown below. The ROX upgrade can be made into a Voyager (with couplers) but generally cannot pack in the Voyager suitcase. The ROX frame will accommodate tires up to 2″ in width. 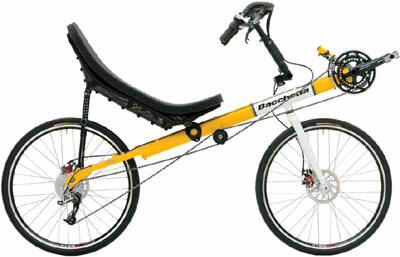 This is the only production 2-wheeled recumbent streamliner. Piloting one is like flying an airplane in your management of side winds. This is the closest thing to HPV racing than you can buy “off the rack.” Under the full fairing is a P-38 with a special boom installed on the frame. The nose cone attaches to that, then the tapered tail attaches to the seat and rear frame. A Lycra sock connects them. These things are not for everyone. The Lightning R-84 is an ultra-light carbon racing frame. 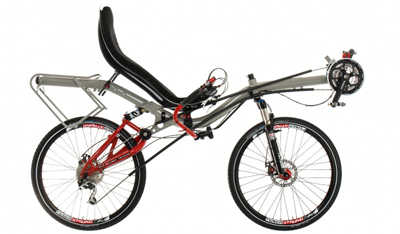 It includes an elegant integrated rear suspension standard and has an optional carbon suspension fork. P-38: $3700 Sport and Performance, $4160 for XT, $4560 for Velocity. Voyager adds $1900. Midracer adds $300. ROX adds $150. Lightning front suspension fork adds $400. F-40: $6700, or around $2500 to upgrade an existing P-38. R-84: $5300 Performance, $6300 Velocity, $7300 Ultralight. The legendary Lightning P-38. With the efficient and unique, patented space type frame that is very stiff in the direction of pedaling forces, but at the same time very light and strong. Unconventional in design, yes. 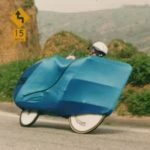 But also, comfort, safety, and speed many times greater than conventional bikes. Experience what thousands of Lightning riders have already discovered, the pure cycling enjoyment and exhilaration of the P-38. The P-38 is Lightning’s flagship bicycle and it’s not hard to see why. Only the P-38 has had nearly 30 years of refinements and record-setting experience to bring it to its current state of development. 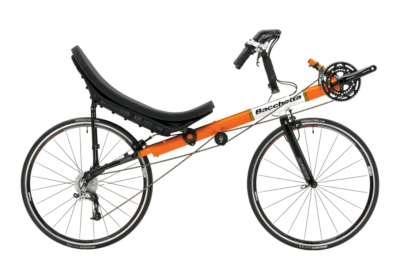 The P-38 is one of the lightest recumbents made, at just 22–26 pounds (depending on size and components), and only its cousin the R-84 climbs better. If you’re ready for the best, the P-38 is ready for you. Forget what you’ve heard about recumbents not being good climbers. 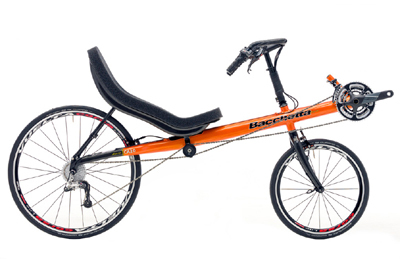 Bicycling magazine dubbed its latest review of the P-38 “A recumbent that can climb!” After about a month of acclimation, a P-38 rider will normally match or exceed his previous performance on an upright. 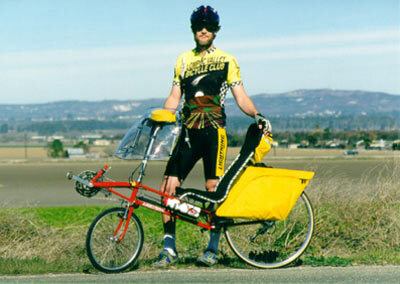 The key is training, as a recumbent uses slightly different muscles than an upright bike, especially during climbing. Colors Azure Blue, Metallic Blue, Yellow, Metallic Green, Jet Black, Starlight Silver, Golden Gage, Crimson Red, White, Starlight Red. See the full color chart. Weight 23–26 lbs. 24–27 lbs. 23–25 lbs. 22–24 lbs. BB height 24 to 26 inches The height of the pedaling assembly. Relative to the seat height these are "high cranks"
Seat height 18 to 20 inches Ergomesh; 17 to 19 inches Midracer Ergospeed carbon This depends mainly on degree of recline, but also on frame size. Front wheel size contributes to this. Small frames only use a 16" wheel, Large and XL only use 20". Medium uses either. Seat angle 50 to 65 degrees Ergomesh; 35 to 40 degrees Midracer Ergospeed carbon These are overall upright positions. 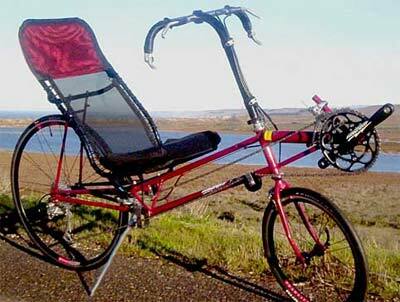 Even the reclined Midracer seat only hits 35 degrees, nearly twice as upright as a Catrike 700. Ergomesh seat Ergofit bend, 7005 Aluminum frame. Nylon mesh back with fitted foam cushion. These seats lace up with long pieces of utility cord. Very lightweight, kind of quaint in a way. Some people ditch this elegant hassle and use a zillion zip-ties, then throw away a lot of spare plastic. Somehow we picture "Lightning engineers" nostalgically thinking that this is how Tullio Campagnolo would have laced up his recumbent seat. Midracer Ergospeed carbon seat Hand laid up woven carbon fabric/epoxy resin seat with integrated aluminum bar frame attachment fittings. Ventilated plastic honeycomb type seat pad with fitted aerodynamic cover. Use of this seat requires frame modifications (shorter seat stays) and a 650C rear wheel. This is a slim, supple all steel fork. You'll need a beefed up Lightning fork for disk brakes. Braze-ons Water bottle (2), pump peg (for Zefal HP pump), drop-out eyelets, cable guides We find the peg for the HP pump kind of quaint too. Frame Nickel Silver brazed Multigauge CrMo, 7005 Aluminum B-B Extension Top quality steel with an aluminum boom (the adjustable piece that holds the crankset). Stem LCD Customlite Aluminum Four different sizes for fitting purposes, with or without top bend. These are chunkier than other brands risers, since Lightning expects you be yanking on the bars for leverage. Handlebars Aluminum, Customlite LCD Drop Bars The standard Lightning handlebar isn't the only option. This bar is optimized to fit under the F-40 fairing. Other bar options are available allowing for a wide range of component choices. We'll discuss all that. Brake levers Tektro SR These aren't anything special as levers go. They are custom bent to fit the P-38 handlebars. Shifters Shimano Dura Ace bar end This kind is the only shifters compatible with the stock P-38 handlebars. Other handlebar and shifter options are available. Front tire 20″ Panaracer Minits Tough 32-406 (20×1.25) 100 psi Schwalbe Durano 28-406 (20×1.1), 110 psi The front fork on this model will not support a wider tire. For specs on the standard F-40 or R-84 models, please contact us.